Twice is nice. Double trouble. Double down. Cliches might be corny, but sometimes there’s some truth to them. If you’ve noticed how many ads, posters, album covers and countless other creative mediums use a mirrored-image effect, then you know that two is better than one. Creating mirror effects in Adobe Photoshop isn’t as difficult as, say, cloning sheep. With some basic tools you can take any ordinary photo or design and create a mirrored double. Mirrored images can be created either horizontally or vertically. A horizontal mirrored effect is great for creating reflections off of building glass or mirrors (of course). A vertical mirror effect works well for creating reflections in pools of water. 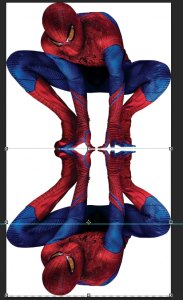 For today’s example we’ll be creating a vertically mirrored image of our friendly neighborhood Spider-Man. Open your original image in Photoshop. 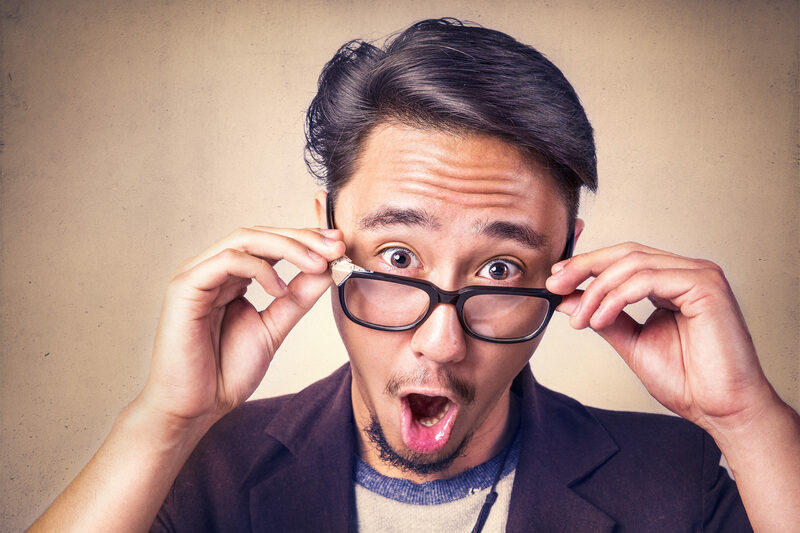 If you don’t know the dimensions of your image, you can go to Image > Image Size to see your image’s dimensions (listed as a width and height typically in pixels or inches). 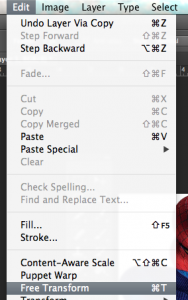 With those numbers in mind, create a new Photoshop document by going to File > New. You want to create a new document that’s larger than the original, giving you space for the mirror effect. I like to double the size in my new document along the dimension I’m working on (such as height in this example). When you’re done, you can crop out any blank space. With your new document ready for action, you can move your original image into place in a number of ways. You can use File > Place to make your original a new layer. You can also click-drag the image into your document. With the new layer in your document, you’ll want to move your image into position using the Move tool. We positioned the original layer at the top of our document. Now you’re going to create a guide. This helps you visualize where you want to mirror your image. Likewise, Photoshop will mirror your image along this line. Go to View > New Guide… and select your guide’s properties. We chose a horizontal orientation. The Position box sets the original position of your guide, but because you can manually move you guide anywhere you’d like, you don’t have to be precise when choosing a position. A blue line will show on your screen. This is an “imaginary line” that won’t show in any printing. Picture you’re mirror effect along this blue line. You can drag the line anywhere you want if you don’t like it’s original position. 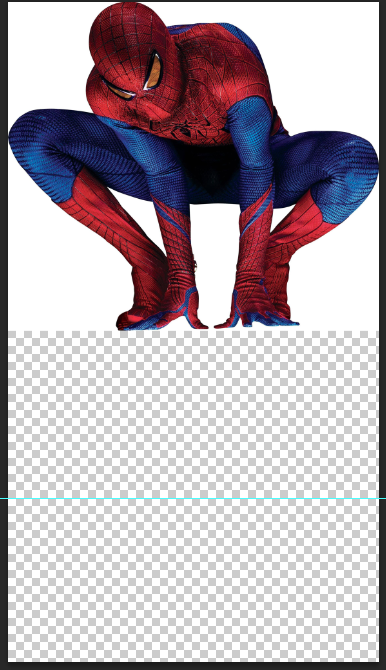 We moved our blue line to the very bottom of the image, because we’re mirroring Spidey’s entire body. With your guide in place, you’ll want to create a copy of the portion of your original image you want to copy. 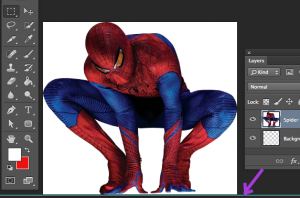 We’re copying our layer in its entirety, but you may only be copying half or even a third of your image. Select your Rectangle Select Tool in Photoshop’s tool palette and click-drag over the area you want to copy. As you can see in our image below, a dotted line surrounds the selected area. 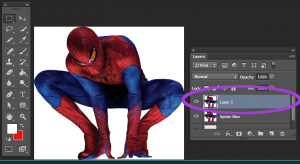 After selecting your image, go to Layer > Layer Via Copy to create a new layer based on your selection. This will be the layer you use to create the mirror effect. You won’t be able to tell that you made a new layer because the new layer is directly on top of your original. That’s about to change. 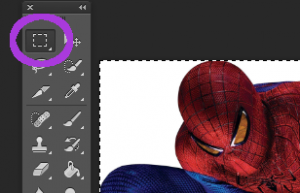 First, double-check that you have a copied layer, by looking at your layers panel. With the preliminaries out of the way, it’s time to work your magic. 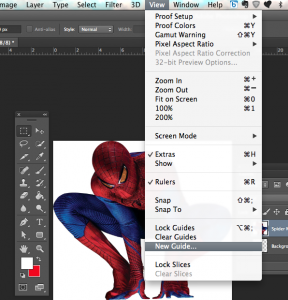 With your new layer selected in the Layers panel, Go to Edit > Free Transform. This creates a “target” on your image. This target represents the point where you’ll mirror your image from. The target will automatically be dead center, but you will need to move the target along the blue guide line you set earlier. With the target on your blue line, go to Edit > Transform. 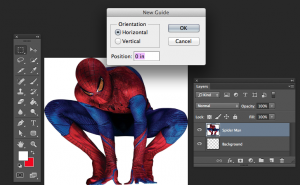 From here, select the axis (horizontal or vertical) that you want to flip your layer on. Presto! You should see your mirrored effect. If everything looks great, you can save your document and celebrate. If you want, you can clear the blue lines and other guides you created by going to View> Clear Guides. 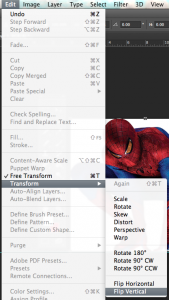 ● Go to Edit > Transform to flip your copied layer. This creates your mirror effect. We didn’t get too creative with our mirror effect, but many designers use this to mimic kaleidoscope and reflection effects. We hope you have fun with this little trick, and please let us know if you have any questions. We’re here to help!